ATM Anthony Thomas Melillo "sweetheart" jersey tee. 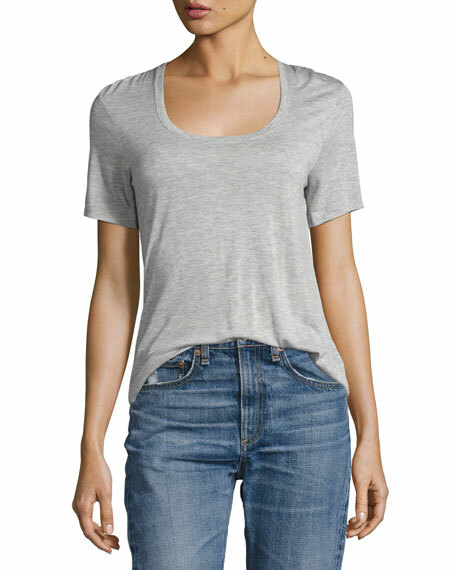 T by Alexander Wang jersey tee with ruched center front and drawstring ties. High V neckline. Short sleeves. Semi-fitted. Cropped hem. Pullover style. Cotton. Machine wash. Imported. Alo Yoga "Afterglow" sheer, double-layer tee with wide-knit mesh underlay. Crew neckline. Short sleeves. Moisture-wicking. Antimicrobial tech. Relaxed fit. Cropped length. Raw-edge mesh hem. Pullover style. Polyester. Imported.